On our original itinerary today we would head to the Tongariro Alpine Pass for two days of long hikes including one 8 hour hike up two mountains. Somehow this idea seemed to make a lot more sense in the US than it did here for two big reasons. Firstly, because of how the roads work it was actually fairly circuitous to get there from New Plymouth. 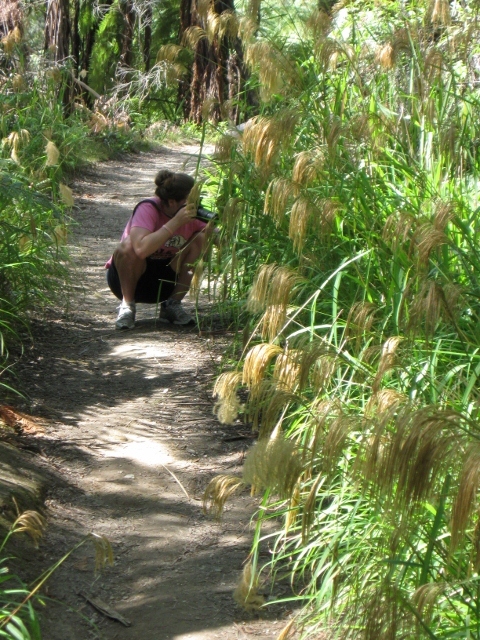 Secondly, neither of us had hiking shoes, jackets, or backpacks necessary for this particular hike. Having met a few people that had hiked the pass it became a little too clear that we were overestimating our abilities and resources. The pass is supposed to be beautiful, but we decided we needed to scrap it and save our time for another trip. So instead we decided we would make a slower decent towards Wellington, spend an extra day in Wellington, and head to Dunedin a day early. Most of mornings of this trip we have woken up with the sun and gotten out on the road as fast possible so as not to waste daylight, but this morning we relaxed. We caught up on emails, read our books in the hostels solarium, and of course made this new plan. When we finally did leave New Plymouth it was around 11am and we had a general sense of the day, but no sure idea where we would end up for the night. Our first stop of the morning was a large hill called the Paritutu Centennial Park in New Plymouth. It is incredibly steep and there is a metal chain to hold onto which allows you to pull yourself up the mountain. Our Father would have been afraid for our lives. At the top there is a nice view of the ocean and power plants – which is sort of a strange combination, but fun and a really good workout! Driving out of New Plymouth we drove around yet another New Zealand Mountain called Mt. Egmont which is supposed to be one of the more dangerous mountains to climb due to the lack of visibility at the top. This region is called Taranaki and today they were having a holiday. This meant we saw a lot more people on the road than we had previously and as we were going down the highway there was a police road block and they were breathalizing all of the drivers. Don’t worry, Taylor’s result said NO ALCOHOL. We thought this was a bit odd at 3pm on a Monday, but I guess since it was a holiday they were worried about people drinking and driving. 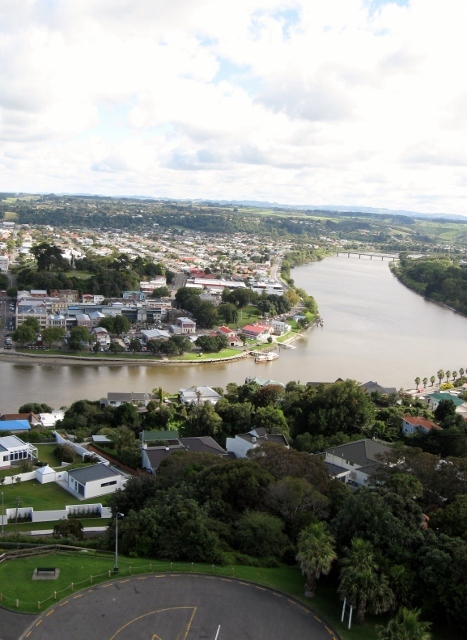 Wanganui is a bit different from most of the other cities we have been to in New Zealand. 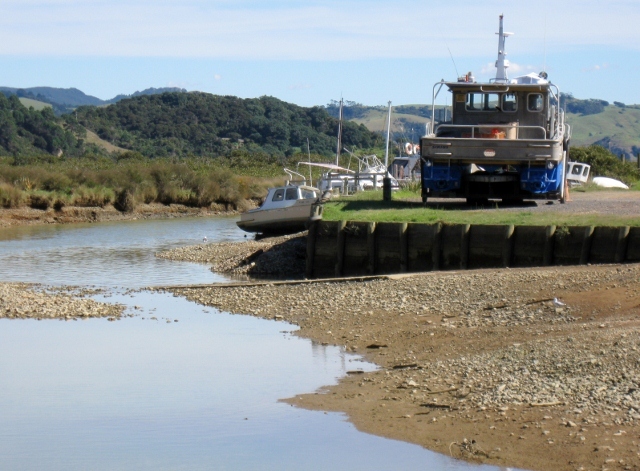 While still close to the ocean, its main attraction is the Whanganui river that runs through the city and used to be part of a major shipping area. The buildings also are less beachy and more what we are used to in small town east coast America – cute little town center lined with trees. We decided to soak up the end of the sunlight by going on a bike ride down the river and through the city on bikes provided to us by the hostel. While not the most ambitious of days it was still enjoyable and beautiful. Today is the day that Haywood has been waiting for this entire trip, the day that we see the Three Sisters and their rock orbs but first, we visited another beautiful beach and drove miles on an abandoned, unsealed highway along the ocean and through rolling hills. 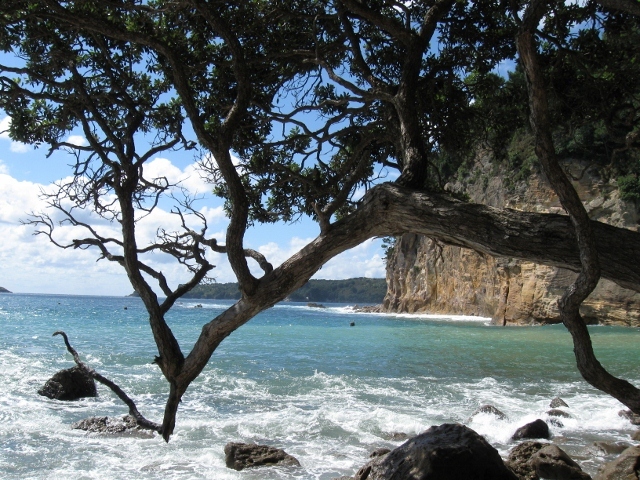 The first beach we went to is called Tunnel Beach. To get to it you have to go through a stone tunnel that has been carved out of the rocks. 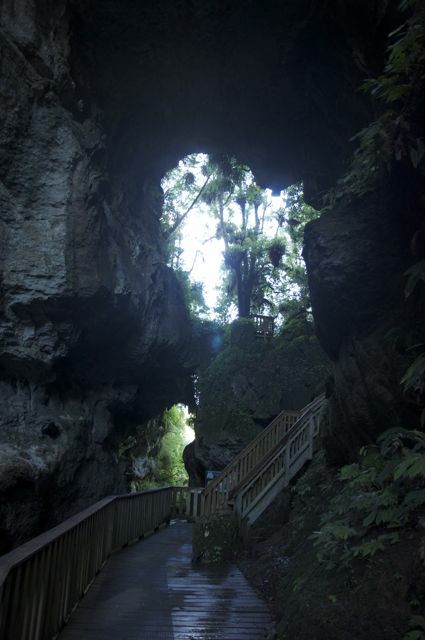 It was originally used as a way to get goods to boats without having to go over the huge cliffs. At high tide the water comes all the way up to the cliffs so they are sheer and have more interesting looking algae growing on them. We made sure to get there at low tide so we could actually see the beach, which is a typical New Zealand black sand beach (due to the iron in the sand.) There are a few places to camp outside the tunnel, but other then that it is very secluded. This was probably the most beautiful beach we had been to yet because of the diversity of scenery and it’s isolation. Just for fun here is a second picture of the same beach. The second beach of the day was another black sand beauty called the Three Sisters because of three large rock formations jutting out of the water. This beach is also supposed to have perfectly shaped rock sphere that have been shaped and polished by the sea. We arrived at the turn off for the three sisters at about 1 pm but the sand path to the three sisters was already cut off by the rising tide (we had been warned to get there at low tide, but it just wasn‘t possible. 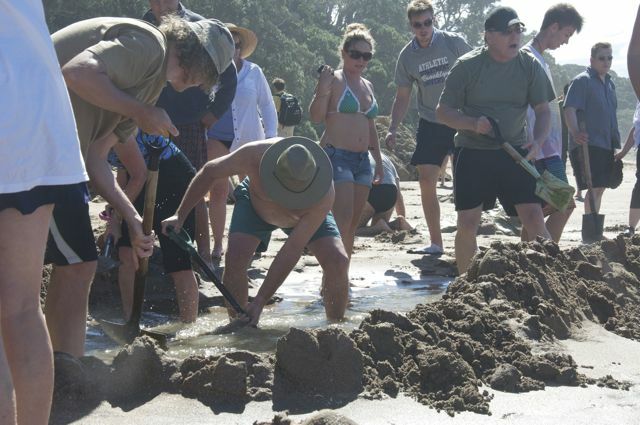 When we realized that the tide was too high to see the sisters we thought perhaps we might wait it out. 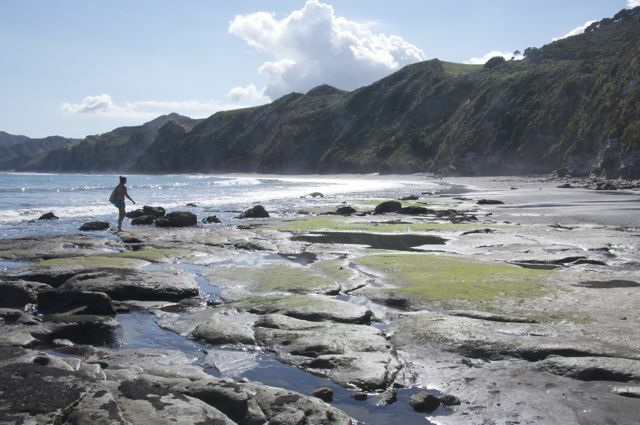 After about an hour reading our books and watching the tide continue to come in, we decided that if we were going to see the three sisters, which was half the reason to visit the west side of the island, we were going to need to swim to them. I don’t know why this didn’t occur to us earlier, the swim was delightful and the three sisters were gorgeous. We didn’t get any pictures because there was no way to take a camera but we assure you it was well worth the trip! 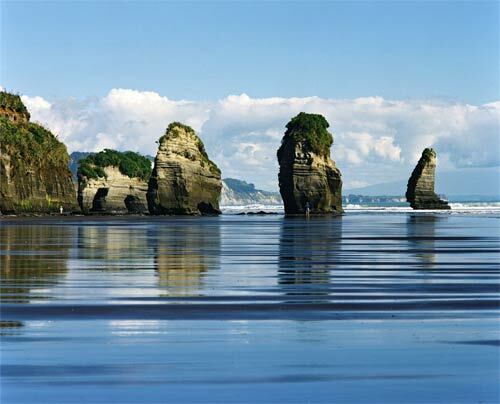 This picture of the three sisters was stolen from www.teara.govt.nz on which it is an example for erosion. 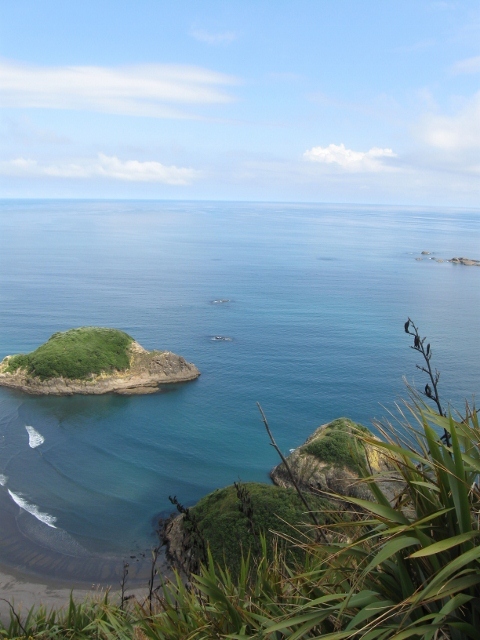 We then made our way to New Plymouth which is an ocean town. They have a walkway along the ocean for the entirety of the town with a wind wand at its center. W couldn’t quite tell if the wind wand moved or looked like two dancers, as it was billed, but it was interesting anyway and a worthwhile walk. We made a nice virtuous salad for dinner since we didn’t do any big hikes today and ate it outside which made for a nice summery feel to the end of the day. After all the nonsense of the day before with getting lost in a circle, today we decided to leave town on well marked roads rejecting a possibly faster but more ambiguous route. 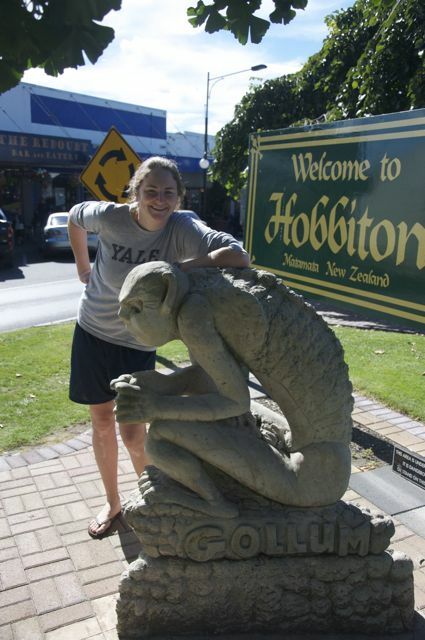 This was also perfectly acceptable to me because it meant we would pass by Matamata, also known as Hobbitton because some of the Lord of the Rings was filmed here. When they finished filming much of set was removed (the rest is part of a 2 and half hour bus tour which we didn’t feel like we had time for) but to help continue the tourism associated with the film, the town constructed statues of some of the characters. It being Saturday, we also stumbled onto a farmers market which we enjoyed wandering around. Unlike the farmers markets that we usually visit, this was a hodgepodge of fruits and vegetables, books, crafts, and what I believe was supposed to be antiques but mostly appeared to be what people pulled out of their garages. 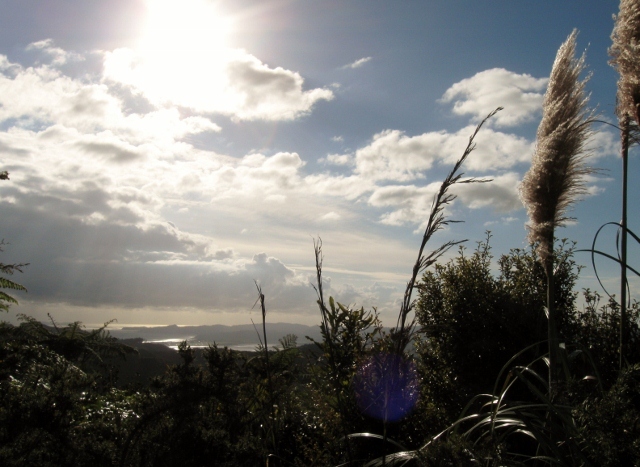 On our way into Waitomo we stopped at a Kiwi and other bird sanctuary. Kiwi birds are nocturnal so we weren’t allowed to take pictures, but they were just the funniest looking birds. We got to see them being fed and one continually attacked the feeder throughout the five minutes she was in the cage, apparently they are also extremely territorial. 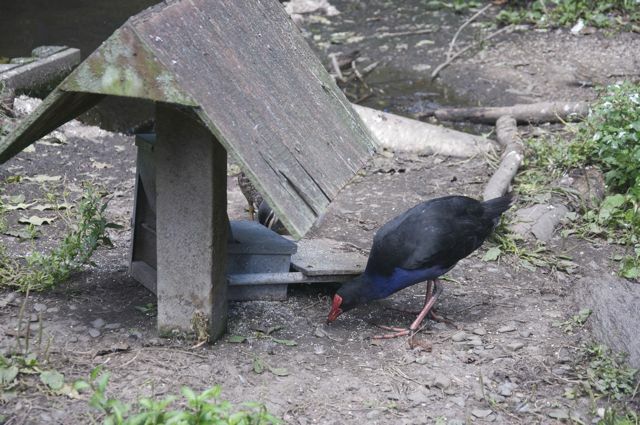 There were many other interesting native Kiwi birds, lizards, and frogs that we saw and have now seen a few of the birds in the wild, my favorite being a black and blue bird we nicknamed the “bruise bird” because we forgot the real name. From there we continued on to Waitomo, Waitomo is a town like Rotorua which has almost exclusively built its reputation and industry on the tourist trade. 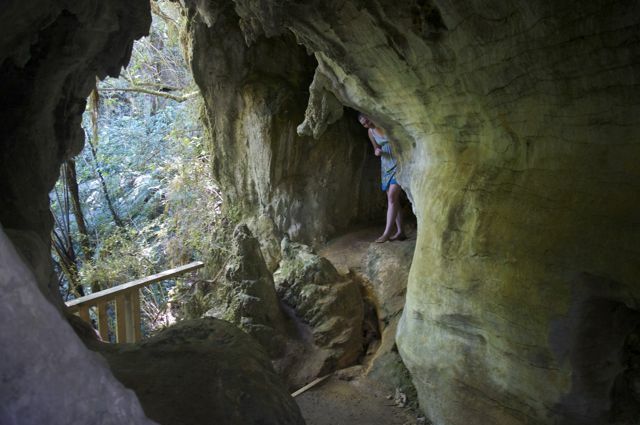 Waitomo is known for its extensive lime stone caverns and white water rafting. After seeing one of the caves we decided that while we were too tired to do a long hike a couple of short ones would be nice. 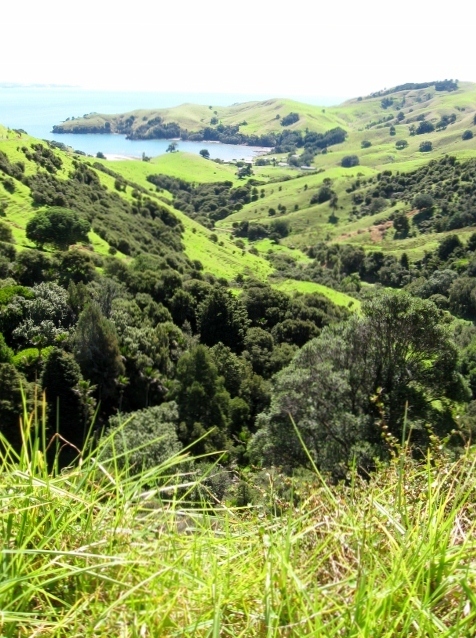 We walked the Ruakuri Natural Tunnel Track which is described as one of the best short walks in the country and it was certainly impressive. The trail swoops up and around river gulleys, into caverns and through tunnels. 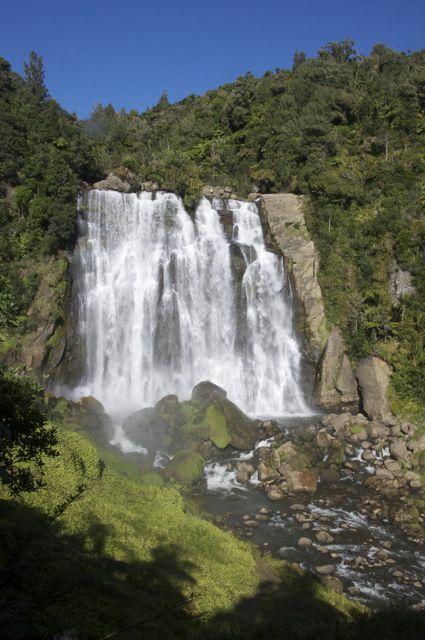 We also saw the Marokopa Falls waterfall. Which is a wonderful, multi-tiered monster. Our last stop of the day was a natural rock bridge, that had been cut away by the water. The rocks here also have fossilized oysters as big as my hand. 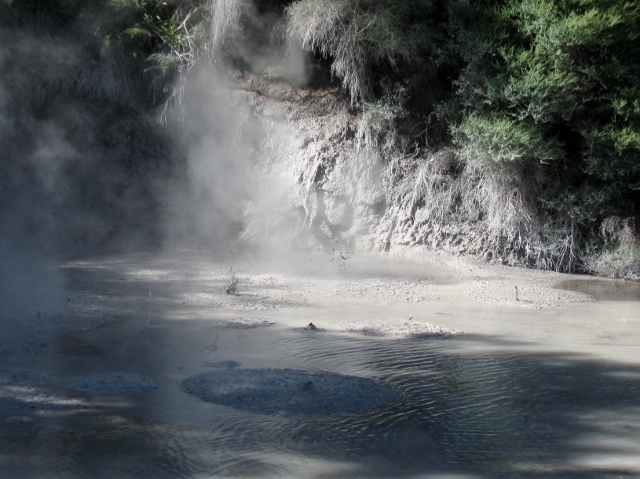 Rotorua is famous for their hot springs, mud pools, and Maori traditions. They are also a tourist trap. We decided to make a stop here anyway because it has the most underground activity of anywhere in the world, but we weren’t quite sure if we wanted to succumb to the tourism and fork over our $40 to see it. We ended up deciding to veer off from the tour buses and headed to Blue Lake just a short drive away. We spent the morning slowly walking around the Lake trail and then had a picnic lunch by the water. 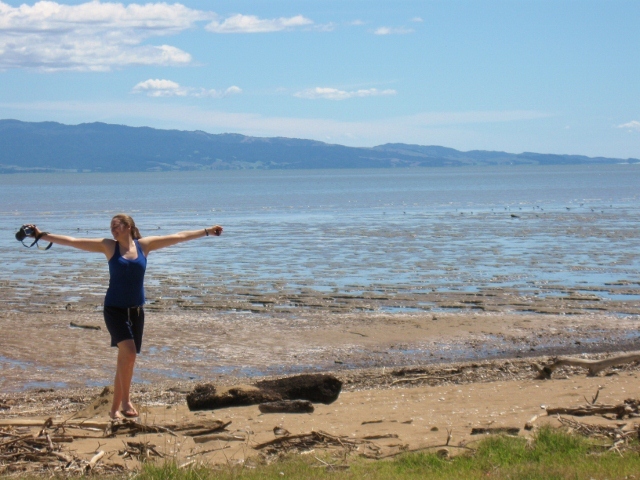 At this point Taylor and I decided we needed to do some “Rotorua things” and then leave the city a night early. We decided a mud pool would be just the thing! I am still a bit confused about the science behind why certain places burp mud, but I am quite certain that burping mud is kind of amusing. The air is sulpherous and smelly, but mud squirting from the ground is entertainment at its best. Feeling slightly more touristy we decided it was time to get out and head to our next destination, Waitomo. We headed out from the Mud Pools along a winding road through the hills. Winding, winding, cows, winding, circle, wait, crap. 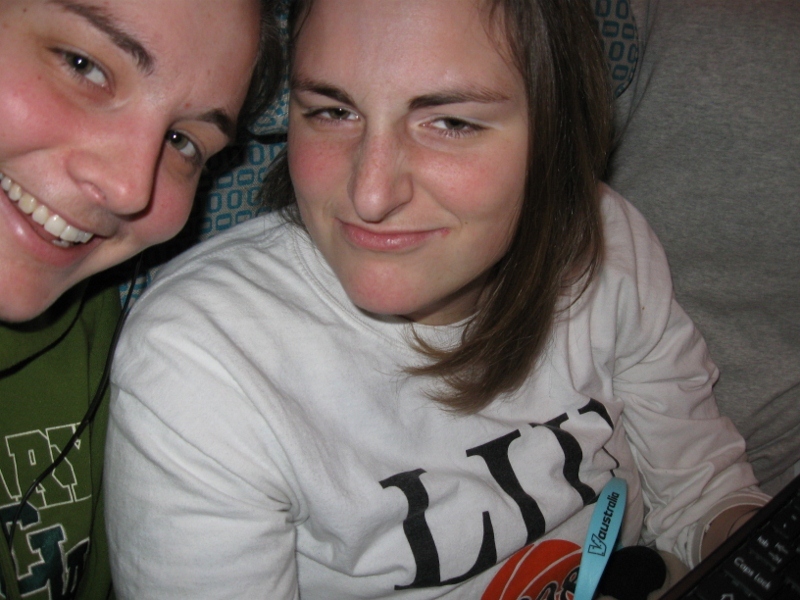 We never did quite figure out where we went wrong, but we did end up figuring out how to get back (an hour + later.) 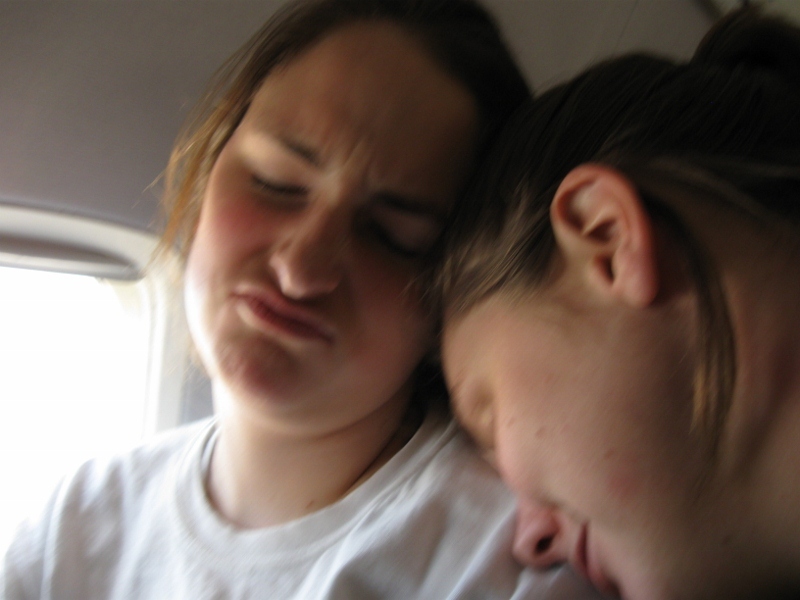 At that point we were both tired so our best change of plans foiled, we headed back to Rotorua for the night. 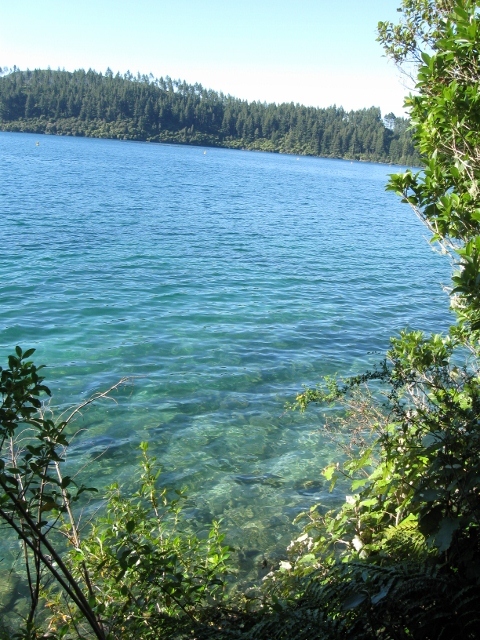 Part of the purpose of this trip is to get from the top of the top island to the bottom of the bottom island and while it is nice that we have some time to do this it does necessitate some days that are mostly driving. Today was one of them but we did find some fun stuff to do along the way. And this is one of the many beautiful views from the ascent. 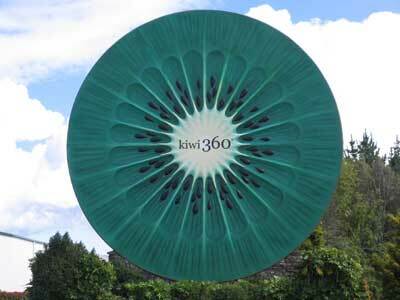 From there we drove along the coast for awhile, enjoying the wind in our hair but eventually we veered inland to visit the Kiwi Fruit Capital of the World and even more importantly Kiwi 360, a sort of theme park for kiwi. 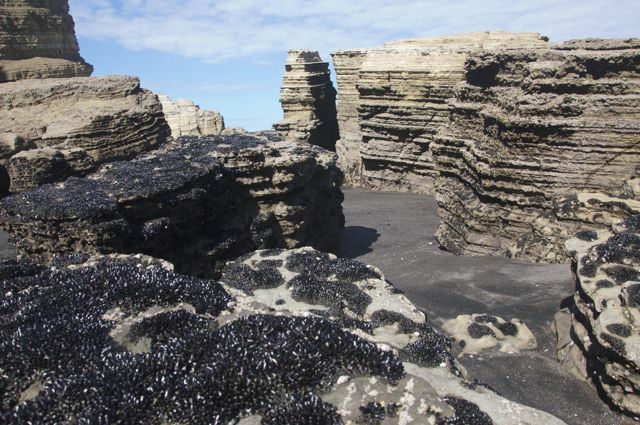 Obviously, this is a must see on every New Zealand itinerary. Day 3 began with a moral dilemma; one of our dorm roommates was in Cormandel with no car (his first major error) and really had nothing to do. Taylor, being the nicer of the two of us, felt that we should offer to take him on our hike; I (being the less nice one) thought we shouldn’t because we weren’t planning to come back that night. As usual, evil won and Taylor cringed as he shelled out a whopping $95 for the bus fare to and from the trail. We felt bad for a while, but it ended up being a good thing because we never did find the trail. Instead, we headed across the Peninsula on well marked roads. 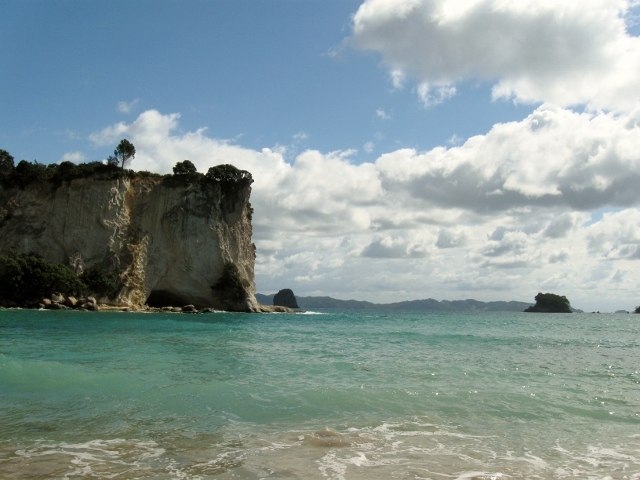 On the other side, we headed to Cathedral Cove, a famous bay hike. We found the top of the trail head (step 1!) and began tramping. Unfortunately, this day was not allowing our plans, and the trail was closed due to falling debris. Taylor wouldn’t let me follow the other hikers and go past the caution sign, but as I am typing this our dorm mates are telling me about how they did and it was wonderful! Blame Taylor! Luckily, we found another bay, while not as famous or impressive (allegedly) it was quite pretty. After our rock adventure we headed down the road to Hahai where we got a picnic lunch (which was then stolen by some audacious birds) and sat on the beach. When we had soaked up all the sun we could stand we headed to, wait for it, yet another beach, Hot Water Beach! It is famous because it sits on top of some sort of geothermal spring so if you dig a hole on the beach it becomes a hot springs of sorts. We were satisfied to just stick our feet into the sand and feel the warmth, maybe, but we did enjoy watching everyone flock to the 10×10 patch while leaving the rest of the beach barren. 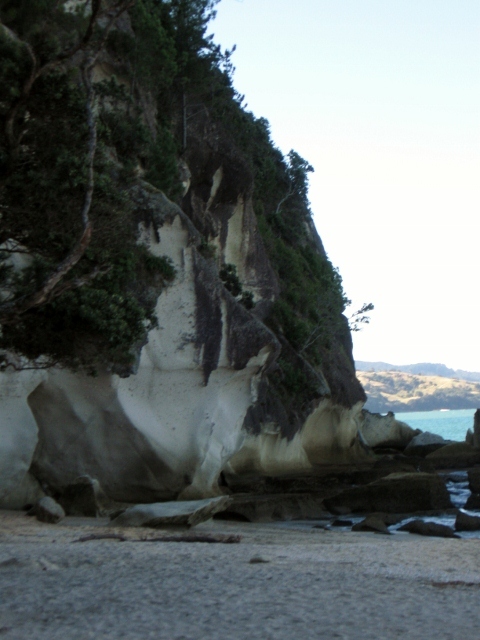 Our last excursion for the day was Shakespeare Rock/Lonely Bay. 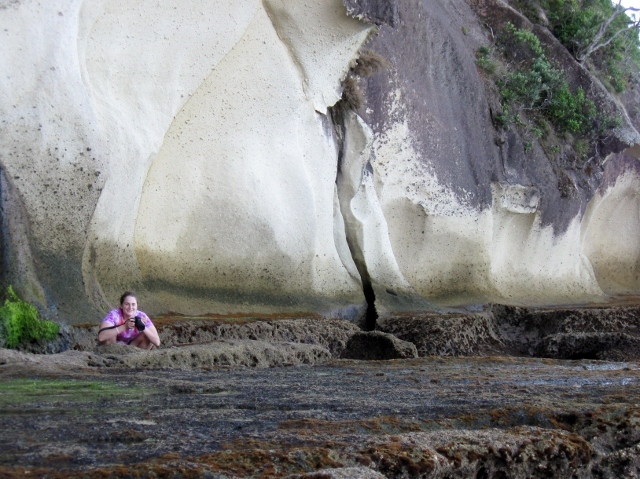 We hiked down into yet another bay where there is a rock formation that looks like Shakespeare’s nose, maybe. In any case, I had a great time looking at the different rocks and algae growing on them. Our day was finally over, all we had left was a 30 minute drive along the coast to Tairua where we had decided to stay for the night. As we were crossing one of the mountain passes we began to hear a funny noise as we went around the turns – we had a flat tire. Thankfully, Taylor has had flat tires before so she had some idea of what to do. At this point a nice Frenchman appeared and offered to help, together we got the car propped up, but try as we might we couldn’t get the rusty bolts out. Exit Frenchman, picture frantic little Taylor and Haywood pouring shampoo on their tire trying to loosen the bolts, this may have happened. Since the shampoo only succeeded in being amusing, we called the NZ AAA, similarly called AA. Just as I was about to give them my credit card number; superman pulled up and changed our tire, while his engine remained running, in under two minutes. He was actually just a Dad with two daughters who saw us struggling in his rearview mirror and was nice enough to come back at save us and $140! He also taught us the nifty little trick of using our feet to loosen the bolts instead of trying, in vain, obviously, to use our weak little arms. After all this excitement we were back on the road. 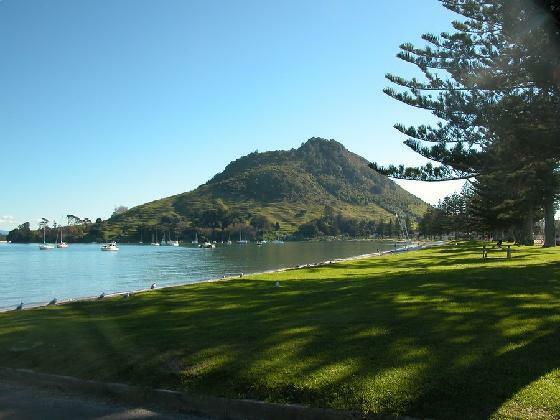 When we finally pulled into Tairua we were tired and hungry. We checked into a hostel and went to the grocery store. By this point it was about 8pm, the grocery store closed at 6pm. Typical. Taylor and I were too tired and couldn’t stomach the fried food at the gas station restaurant so we ended up eating raw green beans and fruit which we had picked up at a stand earlier in the day. I hope it was nutritious, because satisfying it was not. 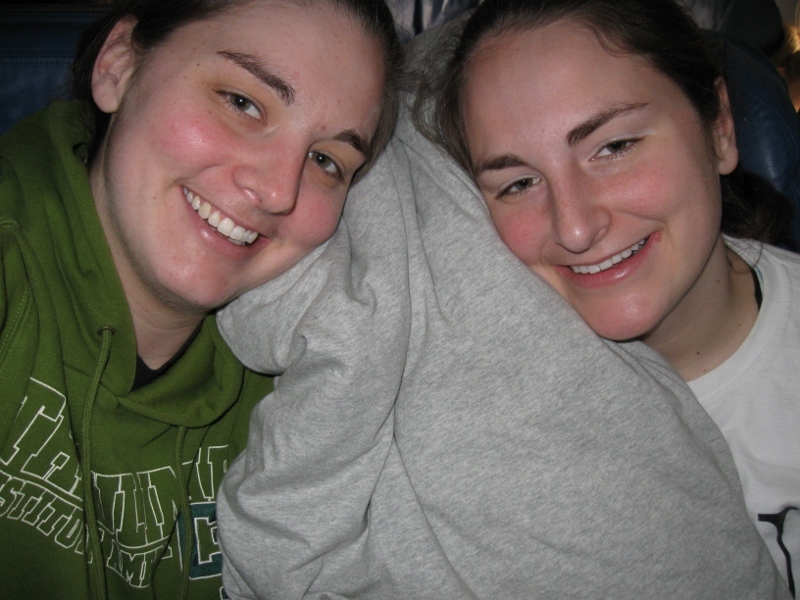 It was an excitement packed day and we were both happy to snuggle into our beds that evening. 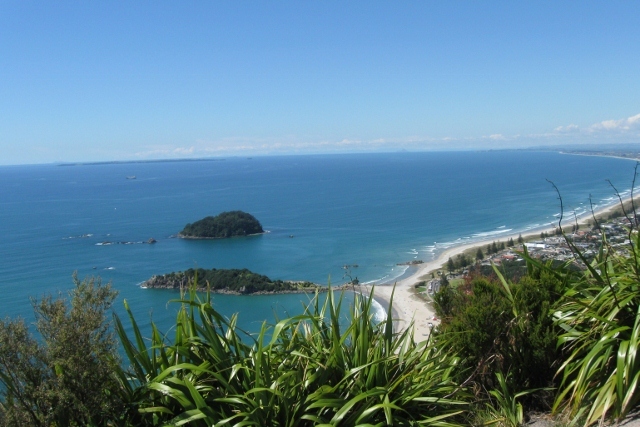 Today, we picked up a car, learned how to drive on the wrong side of the road, and drove to Coromandel along the western coast of the Coromandel peninsula. We stopped and took pictures approximately every 15 feet but as you can see it is beautiful. This is around Thames. This was right before the road began to do hair pin turns following the coast with frequent cliff drops and nothing to obstruct the view. This is a little after Kereta. We thought when we turned inland that it would be an easier drive but as it turns out hair pin drops are even less fun on the mountains with 100 foot drops. 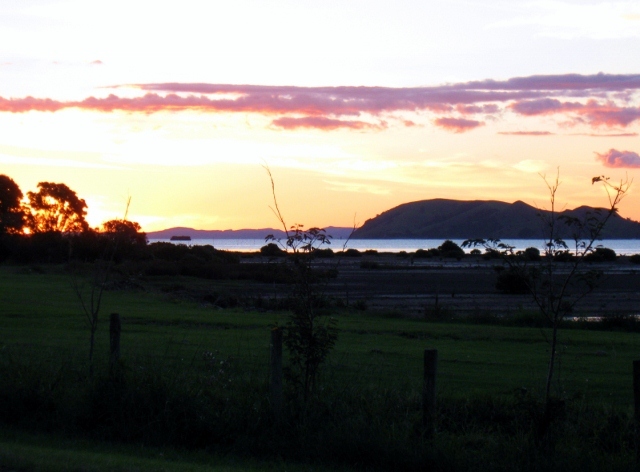 We did safely make it to Coromandel. Where we meandered through town and explored their small harbor. My sister even convinced me to go back out before dinner to take some pictures at sunset. It was a good first day filled with the over brimming excitement that only the first day can bring. By tomorrow we won’t need to stop at every single turn out or gawk at every unusual site. By then this tourist thing with be an old hat. I successfully finished the dessert portion of this blog just in time to start writing about my sister and my portion of the New Zealand blog. I guess I didn’t learn quite enough about procrastination. 37.5 hours in total and please, notice that I never got the window, EVER, but we are so excited to be here. I am leaving the restaurant. I’ve been here a year. This has been a great year in which I have been given an extraordinary amount of opportunities to learn and grow as a person and as pastry cook. Looking through the desserts I have written about here, I think there are some clear lessons to be gleaned. The first being that I have progressed so much in my ability to put desserts together that make sense structurally, in the way the flavors work together and in the way they are plated. These are not things that can be taught but must be learned through experience. Most chefs will talk with great gusto about the people who influence and inspire them. This is because chefs don’t just start as blank slates, they are influenced by what they have seen, what they have tasted and especially what they grew up with. I personally use a lot of Asian flavors and it’s not just because the restaurant happens to have Asian slant, it has more to do with the fact that the people I admire like Asian flavors and I have seen how successfully Asian flavors can be incorporated into desserts. The fact that I know this about myself is an extraordinary gift and I am very grateful to have had the opportunity to begin to find my personal style because it is not an opportunity that most people get this early in their career. Another lesson that is obvious is that procrastination hurts the final outcome. The dishes I am most proud of are the ones that I took the time to think, plan and research before I broke the first egg. The fact that I can throw something together at the last minute and have it be acceptable, doesn’t mean I should. The best desserts are also the ones for which I left myself enough time to edit, rethink and possibly try again. There are days when I can execute the dishes in my head exactly as I intended, but there are many more times when it just doesn’t taste or look quite like I thought it was going to. I have never served anything that I knew tasted bad or was in anyway unsanitary, but I have served dishes that I wasn’t proud of because the prevailing wisdom is that good enough is good enough, and it‘s ok to just go with an inferior product to avoid wasting time or product by making it again. I am learning (slowly) that I am not happy with the result if it is merely acceptable and that working harder earlier is the only way to achieve the results I want. I know there will always be times when you just have to go with what you have, but I want to be pushing myself so that these times only occur because of circumstances outside my control and not because I was too lazy, or tired, or overwhelmed to do it right the first time. It is also very clear that I still have so much to learn and I am excited by this. Culinary school gave me the basic skills to make this past year possible and the restaurant has given me the opportunity to hone these skills; however, I am ready to learn more, to try new things and take on new challenges. I am excited to see what happens next. The dish above is my last dish at the restaurant, so I took the time and really thought about what I wanted to do and how I wanted to put it together. I am proud of the flavors that I got out the ingredients and the variety of textures and temperatures. I’m still not sure about the plating, but it is modern and, if not stunning, at least interesting to look at. The cake is a brown butter pound cake to which I added a banana to keep it moist and soft. The brown butter made the cake nutty and earthy; the brown sugar gave the sweetness a complexity. The white strip of mousse is made of heavily roasted banana, white chocolate and coconut powder. This was the sweetest of the components, but it was also the component with the most clear flavors. The banana and coconut worked especially well together, sort of a tropical harmony. 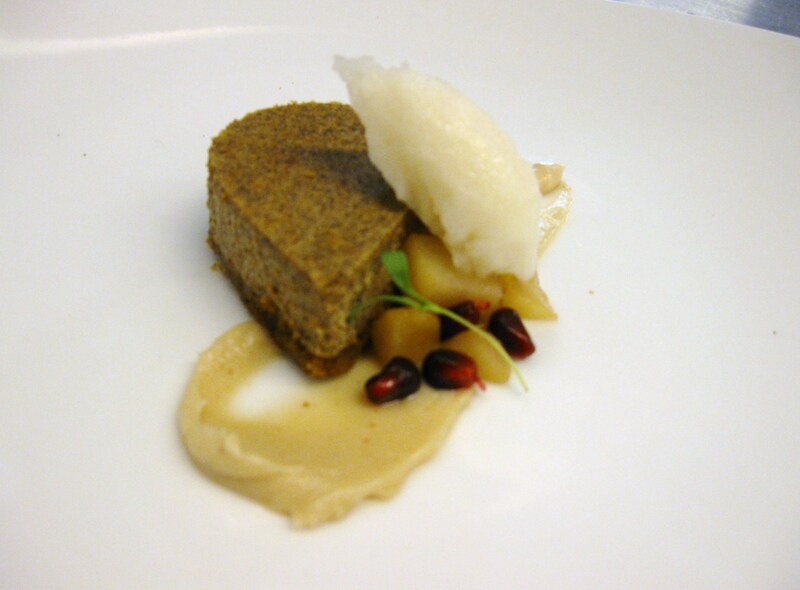 I added to this my favorite fennel pear sorbet which is green and juicy with just a hint of refreshing licorice. The red squares are pears poached in roasted beet juice. This lets the natural sweetness of the pears come out, but also infused them with the taste of sun-drenched, summer soil. There is a crumb on the bottom made of oatmeal, panko, and graham cracker crumbs that have been toasted together and tossed in browned butter. 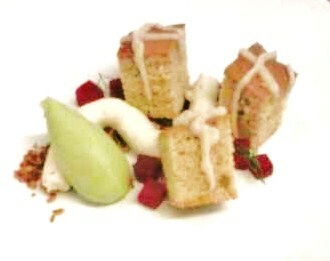 This was added to give the dish one more texture and reinforce the flavors of the cake. The sauce on the cake was added at the end of the process. After tasting the dish up to this point all together, I decided it needed a little more acid, and I wanted to repeat the pear flavor through one more time. So, the sauce is powdered sugar mixed with pear liquor, pear juice, and lemon juice. I wanted this dish to reflect what I like to eat the best, so there are a lot of elements that weren’t that sweet combined with a few that were sweet to push the dish into dessert territory. This dish has a lot of different elements and, at first, it seems unlikely that they could all come together; but, because some flavor elements of each piece intertwine with those of another, the overall effect is to mutually complement one another rather than to be confusing or distract. In the end I was pretty proud of this dish. It hit the flavor notes I was looking for, looked decent, and had unexpected textures. It’s not a perfect dish, but I was satisfied with it, and I felt that my planning and execution had both been rewarded. The Monday after this dessert debuted there was a yelp review of the dish. They hated it. It was their least favorite of all the dishes they had that night, but they did say that they were impressed by complexity of the flavors and textures. I guess you can not win them all. My boss has recently started to think about putting a wintery cheesecake on the menu to replace one of the dishes that seems more connected to the fall. I got excited by this and started making trials for Sunday supper. I made two that were almost exactly the same except I changed the peripheral flavors, keeping main concepts – a rich and creamy, cream-cheese based cheesecake, pears, a thick sauce and the plating. The cheesecake pictured above is heavily infused with chicory and sits on a chocolate-espresso, graham-cracker crust. Chicory used in this manner comes from a tuber in the endive family. It is dried and ground, and is frequently used as a coffee additive. When ground it looks like coffee but has a higher acidity with earthy, chocolate notes. To accent this I made a thick chocolate raisin sauce with rich, deep, dark 72% chocolate and fruity, sweet red raisins. (This is an example of when the concepts in my head don’t come to fruition. I expected this would taste – earthy, acidic, sweet, fruity and it did have all of those components; what I hadn’t anticipated was that it also tasted exactly like a raisinette. However, I like raisinettes, and the sauce did work with the other components so I used it.) I then poached dried figs in armangnac, cinnamon, vanilla and sugar until they were soft and pliant. When I drained the figs, I used the poaching liquid with the addition of a couple of teaspoons of lemon juice to poach the pear cubes. The addition of the lemon juice did two things, it kept the pears from browning too quickly and it changed the poaching liquid enough so that while the two poached items went well together, they didn’t taste the same. I added to this a creme fraiche ice cream because it’s creaminess and light tanginess pulled the whole plate together. I could try to convince you that the addition of the micro greens and pomegranate seeds were for their complex earthiness and subtle tart sweetness or I could just admit that they are there for color. This turned out to be a delicious dish, but it couldn’t go on the menu. 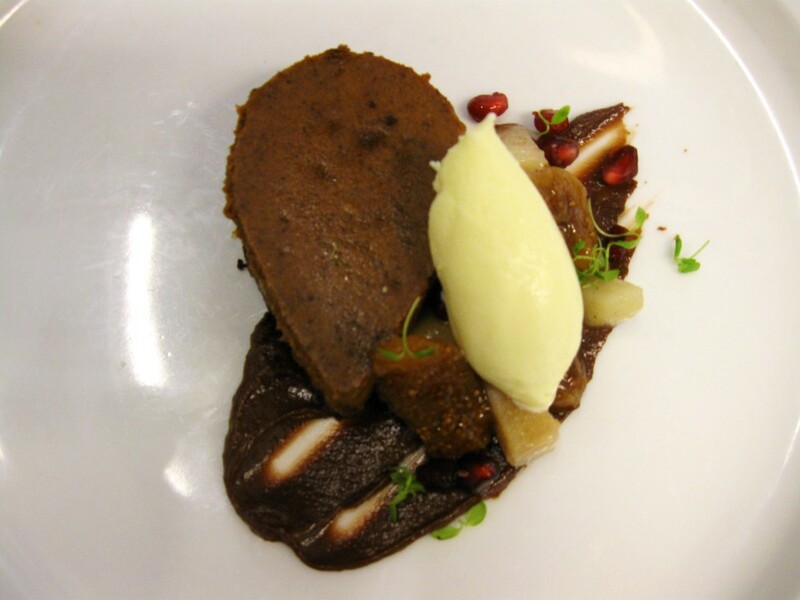 We currently have a chocolate espresso cake on the menu, and this dish, with the chocolate in the crust and the chicory, was deemed too similar. So the next week I tried again. For my second shot at cheesecake, I wanted to play with Asian flavors but I continued with the infused drink concept and used a house-made, spicy chai powder to infuse the cheesecake. This was baked on crumbly gingersnap crust. This time I poached the pears in jasmine tea with a little honey. Jasmine can be an overly aggressive flavor and, when pushed, can quickly begin to taste like soap. So I only poached the pears in the tea for a few minutes, just until the jasmine had seeped into the pears enough to be noticeable but not enough to be overwhelming, then I drained them, and finished poaching them in water. The cheesecake sits upon a toasted coconut and ginger spread. To make this I took a can of coconut milk and boiled it in a low oven with a little sugar and a fair amount of fresh ginger until the proteins in the coconut milk began to toast, the sugar cooks like in jam, and enough water has evaporated to make the mixture thick and viscous. We also use this jam at brunch and I have to admit it is delicious. This is topped off with a lychee and kaffir lime sorbet. The first time I made this I just tried to infuse lychee juice with kaffir lime and, while it was good, I found it a little lack luster. For this batch I got whole lychees and roasted them and then pureed them with kaffir lime. This really wasn’t a bad dish but it just wasn’t as good as the chicory cheesecake and so it too will not be going on the menu.